We must begin with a DISCLAIMER as a database is, to an extent, a "continuous revolution" and constantly in progress. We are trying to do our utmost to keep all links in good working order. If, however, you do happen to come accross disfunctional links or other mistakes, please do not hesitate to let us know. We would be very grateful. As for PERMISSIONS, unless otherwise indicated, reproduction rights of all artworks in this book belong to their creators. We have done our utmost to find and contact copyright or reprint rights holders for all those items that required so and acknowledge courtesies below. When it has not been possible to find a rightsholder, we have considered works orphaned but have retained the information about the sources from which we have obtained our multimedial citations. If possible, we have also tried to find alternative online sources which are, however, often of lesser quality, which is why we kept the reference to the original source as well. Please contact us in case you are a copyright/reprint right holder and have not been but wish to be acknowledged! We are enormously pleased to do so. COURTESIES: Cover & Ill. 0.5 Courtesy: C. V. Starr East Asian Library, University of California, Berkeley; digital image, Courtesy: Lincoln Cushing / Docs Populi. Ill. 0.4; 2.4; 2.5; 2.7; 4.11a; 4.13; 5.64; 5.76 Courtesy: Barbara Mittler. Ills. I.1, I.2, 1.9, 4.1; 4.6; 4.14 a&b; 5.76; 6.43 a&c Courtesy: Pierre Lavigne. Ill. 1.11 Courtesy: Oxford University Press New York. Ill. 2.2b Courtesy: The East is Red, LLC sales@theeastisred.com. Ills. 2.8, 2.9; mus 2.9. Courtesy: Schirmer. Ill. 2.12 Jeffrey Wasserstrom. mus 1.2; 2.1; 2.3; 2.4; 2.7; 4.2. Courtesy: Institute of Chinese Studies, University of Heidelberg. Ill. 4.7a Courtesy: William Joseph. Ill. 4.16 Courtesy: Yugong Yishan, Beijing. Ills. 5.10; 5.11 Courtesy: Wenwu Chubanshe Beijing. Ill. 5.16 Courtesy: Thames & Hudson. Ills. 4.2; 4.4; 5.38; 5.72; 5.73 Courtesy: University of Westminster Chinese Poster Collection. Ills. 5.4; 5.20. Courtesy: Maria Galikowski. Ills. 4.8; III.1; 5.5; 5.6; 5.12; 5.17; 5.19; 5.22; 5.23; 5.32a; 5.34; 5.40; 6.32; 6.33 Courtesy: University of California Press, Berkeley. Ills. 4.12; 5.1; 5.3; 5.7; 5.8; 5.71; 5.84 Courtesy: IISH Stefan R. Landsberger Collection. Ill. III.2 Courtesy: Michael Wolf. Ills. 5.25; 5.42; 5.43; 5.44; 5.61; 5.75a Courtesy: Zhang Hongtu. Ill. 5.26 Courtesy: Zhu Wei. Ills. 5.27; 5.28 Courtesy: Wang Xingwei, Galerie UrsMeile, Beijing-Lucerne. Ill. 5.31b Courtesy: Gerhard Richter, 2012. Ill. 5.41 Courtesy: Martina Köppel-Yang. Ill. 5.47 Courtesy: Geremie Barme. Ills. 5.40; 5.57 Courtesy: Ai Weiwei, Galerie UrsMeile, Beijing-Lucerne. 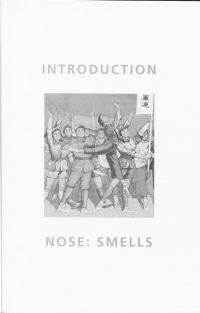 Ill. 5.60 Courtesy: Gao Brothers. Ills. 5.62; 5.63; 5.65 Courtesy: Liu Heng Shing, Hong Kong Taschen. ll. 5.68 Courtesy: Xue Song. Ill. 5.69 Courtesy: Qiu Jie. Ill. 5.74 Courtesy: Wang Keping, Zürcher Paris, NY. Ill. 5.81 Courtesy: Gudmundor ERRO. Ill. 5.82 Courtesy: Li Shan. Ill. 5.83 Courtesy: Yin Zhaoyang. Ill 6.12a Courtesy: Opal Mogus Books. Ill. 6.43b Courtesy: Andreas Seifert. This database was conceptualized both as an online companion to the printed edition of A Continuous Revolution: Making Sense of Cultural Revolution Culture and as an online database about Cultural Revolution Culture that can be used independently as a "virtual museum". Just like the book, the database contains an Introduction, Three Parts with 2 chapters each (Part One, Two, Three) and a Conclusion. In order to enter the contents, you can either use the "Enter Site" button on this page. Alternately, you can use the image links on the splash image on the top of this page. Each part of the book is represented by an icon which is identical to the icon used for respective parts in the printed edition. In addition to the materials to be found in the book, the database features a large pool of multimedia material (image, sound and video files), metadata and a sophisticated search function. You may also find references and further internal and external links. Links within this database open in the same browser window or tab, external links, e.g. links to sites where some of the images or videos originate from, open a new browser window or tab so that you can easily navigate back and forth. Reading the book, you may also use the quick search on top of every page which offers you a way to quickly access materials not contained in the book or online contents related to the printed illustration you might be looking at. Simply type in the number of the illustration or media file as given in the book (e.g. ill. 1.1 or mus. 1.1). You can also search using the titles of illustrations, musical pieces or videos. On page 13 in the Introduction to the book, ill. 0.3 is mentioned. If you search the database using quick search for ill 0.3, you will find that in the database ill. 0.3 actually consists of two consecutive images and that it provides a link to a video of the spectacular scene in Song of the Dragon River. 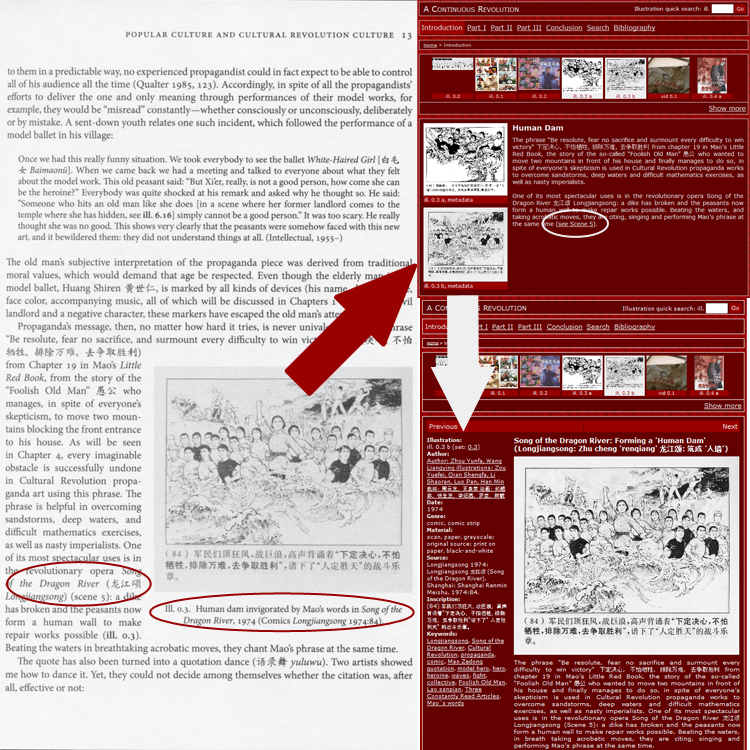 Once you are on the details page of a specific image (lower right corner of the image above), you will find the illustration's meta data to the left and the description to the right. A larger version of the illustration is provided once you left-click on the illustration. 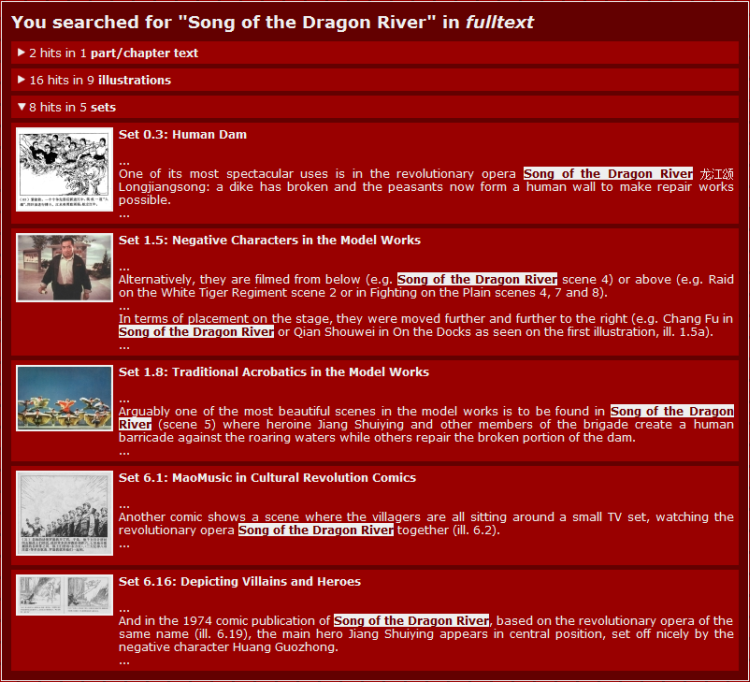 If you proceed to type in "Song of the Dragon River" in the global search you will find several related scenes both from the model opera itself, from the comic version of the model work and from other related model works. References are given in Social Citation manner, you can find full references in the Bibliography. References to online resources are to our digital archive DACHS (Digital Archive of Chinese Studies). DACHS Catalogue entries can be viewed freely. In order to access the online resources in DACHS, however, you need to apply for a password with our DACHS Team. An overview of all resources referred to in the book and the database that have been archived in DACHS, can be accessed here. Images in the Heidelberg University Image Archive HeidICON are only accessible by university members with a university user account. You could still have a look at HeidICON through a guest account (Gast-Zugang). It is to Rudolf Wagner, Meng Yue and Ted Huters that I must bow for “putting me on the road” to this project. I thank the participants in the 1994 and 2001 workshops on Rethinking Cultural Revolution Culture (and especially Chen Xiaomei, Carma Hinton, and Catherine V. Yeh) for so enthusiastically sharing their insights and I am grateful to my students in Heidelberg, Guidel and Marburg, who participated in courses dealing with Cultural Revolution Culture over the past years. I would like to thank Chan Hing-yan, Catherine V. Yeh, Jeffrey Wasserstrom, and Andreas Steen for helping me find some of the three dozen or so interview partners who themselves chose to remain anonymous. Their anonymity notwithstanding, I am enormously grateful to them for generously sharing their time and insights on this complicated period in Chinese history. I thank the Popular Culture Group at Heidelberg, some of whom, like Jennifer Altehenger, Nora Frisch, Sebastian Gehrig, Huang Xuelei, Sun Liying, and Xiong Jingjing, have generously shared their own materials or helped collect and order important sources for the writing of this book. Benjamin Kemmler, Ann Katrin Dethlefsen, Sylvia Schneider, Sun Hui, Miriam Seeger and Li Shuang, too, provided constant, patient, and reliable support, checking footnotes and Chinese characters, entering metadata, archiving online data and rescanning images. I thank my colleagues, Thomas Kampen, Susian Stähle, Gu Wen, Michael Schönhals and Mark Elvin as well as longtime friends, Paola Zamperini, Hans van Ess, Christiane Brosius and, last but not least, Thomas Maissen for many a good idea as well as critical and material input. Finally, I would also like to thank Kristen Wanner from Harvard University's Asia Center Series for her constant, continuous and unfailing support. Critically important in making this database come to life has been Matthias Arnold who has accompanied my every single step into the world of Digital Humanities so far. Christian Straube who is a model hero in true Cultural Revolution terms when it comes to altruism, patience, and generosity with his own time and resources, has programmed this database and taken on the painstaking task of fine-tuning it over many many months in the past year. Without him, none of this would have been possible. I dedicate this database to my family who have always been my most important source of energy and strength throughout these years and hopefully many more to come!